How to watch Tattoo Tales: Season 1 (2015) on Netflix Bangladesh! Sorry, Tattoo Tales: Season 1 is not available on Bangladeshi Netflix, but you can unlock it right now in Bangladesh and start watching! With a few simple steps you can change your Netflix region to a country like New Zealand and start watching New Zealand Netflix, which includes Tattoo Tales: Season 1. We'll keep checking Netflix Bangladesh for Tattoo Tales: Season 1, and this page will be updated with any changes. Tattoo Tales: Season 1 is not available in Bangladesh BUT it can be unlocked and viewed! Cameras capture poignant stories, silly antics and dazzling inkscapes inside a tattoo parlor on Sydney's popular Bondi Beach. From the shyest first-timer to the toughest ink vet, at Bondi Ink Tattoo, everyone has a tale to tell. Season 1 of Tattoo Tales has 8 episodes. Because different Netflix countries have different availability for episodes, you'll need to check the episode listing below to see which are available in Bangladesh. A brother and sister get tattoos to honor their late mother, a dancer wants old ink covered up, and a retro couple immortalizes true love. 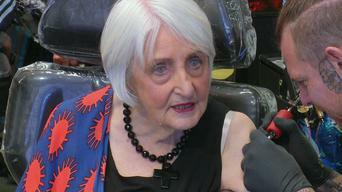 An 83-year-old woman gets a birthday tattoo, a nervous mom goes under the needle, and a musician gets inked to honor his religion. A man gets a tattoo of his girlfriend's lips, a new father celebrates his first child, and a paralyzed biker adds to her impressive tattoo collection. Three tough sailors salute their late father, a breast cancer survivor commemorates her journey, and an entire family gets tattoos together. Married sports fanatics mark their team's big win, a tattoo zealot adds to his collection, and a spiritual seeker finds enlightenment in ink. An ex-con and his girlfriend want to cover up ink from their past, and a dad gets tattoos of his newborn son's hands and feet. A tough guy pays tribute to his cultural heritage, a burlesque dancer memorializes her grandmother, and a roller derby player turns over a new leaf. A big pop star gets the VIP treatment, a museum curator tells her story in ink, and an ailing woman gets a tattoo of her beloved dog.